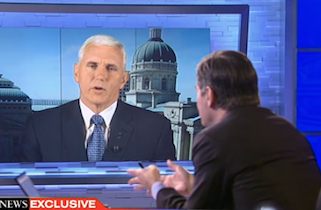 CHICAGO – In one of the worst interview appearances in recent memory, Indiana Republican Gov. Mike Pence came across as defiant and evasive on ABC’s This Week with George Stephanopoulos. When pressed on whether Indiana would allow discrimination against LGBT people, Pence looked like a deer caught in the headlights and ultimately punted. Pence left wiggle room for addressing the outrage, placing the burden on state lawmakers to send him an updated bill, which would (based on Pence’s comments) likely come up short and please no one. Last week, Truth Wins Out released a video in its “Flipping the Script on Religious Freedom” campaign, to highlight the real-world consequences of laws that purport to protect religious liberty, when in reality they only promote exclusion. In the new video, which already has 17,000 views, we show how such laws can open a can of worms and backfire on the “Christian” sponsors of such bills. On Saturday, Truth Wins Out Executive Director Wayne Besen addressed the Indiana law on “I’ve Got Issues,” his radio show on WCPT Chicago. He interviewed New York Times columnist Frank Bruni and National Center for Lesbians Rights legal director, Shannon Minter, about the damaging new law.